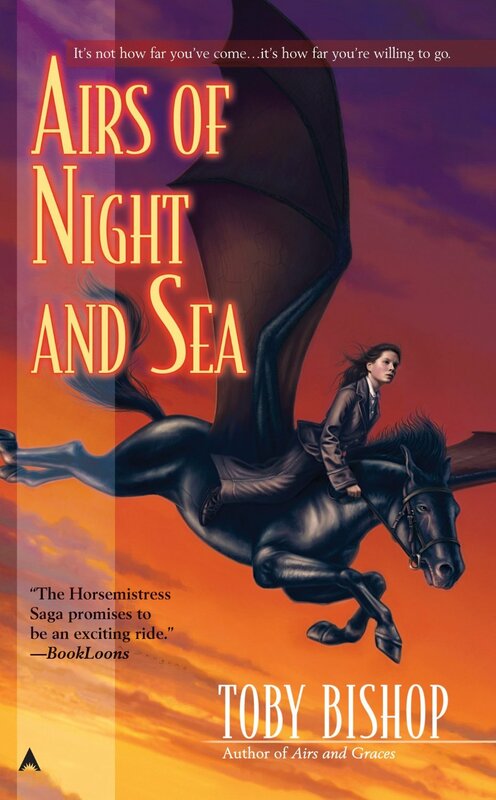 "In the third book in the Horsemistress Saga, begun by Airs beneath the Moon (2006) and continued in Airs and Graces (2007), young Larkyn Hamley is nearing graduation from the Academy of the Air, but the academy is under threat from the mad Duke William, who plans to close it and open his own flying school devoted to training well-born young men to ride the flying horses of Oc, none of which has ever tolerated having men anywhere nearby. William has posted soldiers at the academy in the hope of capturing the girls’ instructor, Mistress Philippa Winter, who has been forced into hiding. The scenes of horses and riders in flight and battle are breathtaking; political machinations abound; and the dangers to the academy staff and students are palpable as Lark and her beloved horse, Tup, join forces with Mistress Winter and others in a desperate effort to thwart the duke’s evil plans. The saga’s fans are sure to welcome the latest installment."